Hi Everyone, Cheryl here. 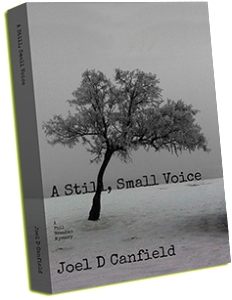 Below is a guest post from my friend and fellow author, Joel D Canfield. I’m honored to be part of his blog tour for his latest novel’s release. Enjoy! Being the shy, sensitive type, I try to avoid shocks. Don’t like loud bangs. Bright lights are painful. Quick movements trigger my duck-and-dodge reflex. Gore and other explicit stuff in my entertainment turns me off. As a result, the pool of introspective noir I can enjoy is limited. Elvis Cole and Harry Bosch are near the edge of my realm. Kinsey Millhone hasn’t scared me yet. Sam Spade and Philip Marlowe are fine. Nero Wolfe and Archie Goodwin make the grade. They say you should write the book you want to read. I’ve done that at least five times now, written introspective noir that’s safe for the most delicate constitutions. 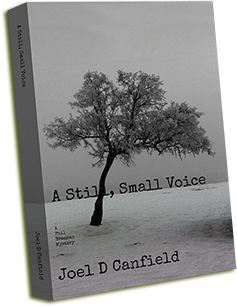 My latest, A Still, Small Voice is my 15th book, but only my 5th mystery. It’s the second featuring Phil Brennan, who, yes, is named after Mr. Marlowe, the hero in all the books written by the greatest mystery writer ever, Raymond Chandler. Phil Brennan is a loner. Was, I guess. He’s getting to know the folks in his neighborhood. Some of them are great. Our man Brennan, of course, judges everything by his childhood and his failures, which means sometimes he misreads people and situations. Truth be told, my books barely qualify as mysteries. There’s always something unknown and someone trying to uncover it, but that’s never the core of the story. These stories are about morally rigid people jammed into morally ambiguous situations, forced to make the best bad choice. No, you won’t find any overt preaching about right and wrong. You’re a grown up. You already know. What you will find is the vicarious experience of a good guy struggling through bad times and coming out okay in the end, even if he is a little ragged and rumpled by the process. What was the question again? Oh, yes. Your favorite mystery author everyone should know about. Fire away.